The men who worked alongside Fermi in Chicago, including Crawford Greenewalt, Herb Anderson, and Arthur Holly Compton, describe the construction of Chicago Pile Number One. They narrate the day of its first successful operation, December 2, 1942. Fermi’s meticulous measurements and accurate predictions are cited as primary factors in this achievement. The program also discusses Fermi’s evolving role in the Manhattan Project, including his trips to Hanford and his move to Los Alamos in 1944. Part 3 concludes with the morning of July 16, 1945, when Fermi witnessed – and measured the yield of – the Trinity Test. Narrator: Finally, the decision was made: build the pile in the west stands. The facilities under Stagg Field included the usual locker room, showers, and four handball or racquets courts. The heavy graphite material began to roll in on large skids the same night. The racquets court was sixty feet long, thirty feet wide, and twenty-six feet high. It would house the pile, which would take the shape of a sphere or doorknob, flat on top, almost reaching the ceiling. It would be built up of graphite blocks containing lumps of uranium. As work progressed, carpenter Gus Knuth recalls some of the problems. Gus Knuth: Then the pile went up to ten feet high, and it started getting wider and wider at the top. [Herbert] Anderson and everyone wanted to know what I could do. I said, “I cannot do anything. I don’t know. I haven’t got the education. I will leave it up to you fellows.” Then they shut it down for a day and night. Narrator: Fermi was never without his slide rule. It became a trademark of his character. Many recall how often he used it, including Otto Hillig. Otto Hillig: I remember one incident. I think it was the scaling. He had told [Walter] Zinn to do some certain experiment the week after he came there, and since that experiment did not work out, he got out his slide rule and in a couple of minutes he was figuring and figuring. He said, “It has to come out!” so he sent it to the experiment room, and doggone it, it did come out right. That is why I called him “Great Master.” He called me “Great Dane” and I called him the “Big Master” when he came in in the morning. Narrator: Fermi’s slide rule even led to the creation of a humorous law of physics developed by Crawford Greenewalt. Crawford Greenewalt: Perhaps I should have said this first – because it is the thing that I remember best – and that is Enrico Fermi’s complete calmness. He was walking around as if he was simply waiting for the barber to say, “Mr. Fermi, come have your hair cut.” It was just as casual and calm as that. Every so often he would pull a little three-inch slide rule out of his pocket, and make a few stabs with it. Since I used a twenty-inch slide rule, from those two bits of data I formulated Greenewalt’s Axiom of Three, which is that a person’s intelligence is in inverse proportion to the length of his slide rule. Narrator: It took six weeks to assemble the final pile: from late October to the first days of December, 400 tons of graphite and fifty tons of uranium. It was a deceptively simple device contrived to make a sufficient number of neutrons do their duty. When reactor engineers were stumped by the lack of nuclear data, they would put their problems to Fermi. Fermi would protest that he could not help them, because the number they wanted had not been measured and could not be predicted. The engineers, ignoring Fermi’s protest, began reciting slowly a series of numbers while watching his eyes closely. The correct number would produce an involuntary twinkle in Fermi’s eyes. On the night of December 1, the control rods were locked. The fifty-seventh layer would make the pile go critical. Only little more material would be needed to finish it. Further work was postponed until the following day. On the morning of December 2, 1942, the steam lines under the stands were again out of commission. It was cold, drafty. The environment inside never created a false sense of security. Groups of scientists began to gather in the racquets court. On the balcony at the east end were Fermi, Zinn, and Anderson, grouped around some instruments. On the floor beneath the balcony, young George Weil was standing by to handle the final control rod. On a platform above the pile stood the liquid control squad. Crawford Greenewalt describes the scene. Greenewalt: The whole atmosphere there was one of calmly observing an experiment being made. To be sure, there was a suicide squad that you could see on the other end of the other platform with their cadmium nitrate ready to pour in if it did not work. But it became obvious very quickly that it was going to be controlled. Narrator: The experimental procedure was one of calm routine. The pile had been built up slowly, layer by layer. At 9:45 a.m., Fermi asked that the cadmium strips be pulled out and the neutron density checked. Next, he ordered the electrically operated control rods withdrawn. Shortly after ten o’clock, he asked for the emergency rod to be pulled out and tied. Walter Zinn and Herb Anderson describe the scene. Walter Zinn: Fermi, of course, gave the instructions. He made the calculations, which were not really very elaborate, but had to be done correctly at the time. He got information to make his calculations from recorders. He also got measurements from Leona Woods. A station had some counting equipment, which was in another part of the room. Herbert Anderson: He made an initial test of the activity, and then called for withdrawal of the control rod and made another measurement of the radioactivity generated. Then, with a slide rule, he calculated what would be the effect if he took the rod out somewhat more. [He] announced this. He said, “Now you look at this and it will rise this high.” They pulled out the rod and it went that high and the counters clicked a little more. [He] kept this up a number of times, each time being right about it. Narrator: Eleven o’clock. The clicking of the counters speeded up again. The pen climbed a few more points. At 11:25, the automatic control rod was reinserted, and again Fermi predicted the increased rate. His calculations were so exact they said he was able to predict, to the exact brick, the point at which the reactor would become self-sustaining. Norman Hilberry contributes some insight to Fermi’s uncanny accuracy. Norman Hilberry: Fermi had the night before sat down and computed what the trays on the recording galvanometer would be for every single position of the control rod. Clearly if there were any new law of physics, it would begin to show up in an actual deviation of the observed graphs from those he had computed. And each time, it hit absolutely right on the nose. I am sure that long before Fermi finally said, “George, pull it out another ten inches,” the question had long since been settled in his mind. It was long since settled in mine too. Narrator: 11:35. The automatic safety rod was withdrawn and set. Another withdrawal of the control rod and the counters began clicking faster and faster. Suddenly there was a loud thud, then silence. The safety point of the automatic rod had been set too low and it had slammed home. Fermi called a recess for lunch, and the group headed for the student cafeteria. Gus Knuth recalls his surprise. Knuth: Like I say, they were all sitting there watching Fermi. Fermi would give the okay and then when he saw everything was right on the button, he says, “All right. Let us go have a coffee and let us have some lunch.” Just like that: just as if nothing happened. Narrator: By 2:00 p.m., the scientists were back in the racquets court. The experiment continued. Herb Anderson remembers Fermi’s confidence. Narrator: The cycle had become habitual—setting the automatic rod, withdrawing the control rod, listening to the counters, checking the graphs, resetting and beginning again. The most dramatic description of the final minutes of the event came from Arthur Holly Compton. Arthur Holly Compton: We entered the balcony at one end of the room. On the balcony, a dozen scientists were watching the instruments and handling the controls. Across the room was a large cubical pile of graphite and uranium blocks, in which we hoped the atomic chain reaction would develop. Inserted into openings in this pile of blocks were control and safety rods. After a few preliminary tests, Fermi gave the order to withdraw the control rod another foot. We knew that that was going to be the real test. The Geiger counters registering the neutrons from the reactor began to click faster and faster, until their sound became a rattle. The reaction grew until there might be danger from the radiation up on the platform where we were standing. “Throw in the safety rods,” came Fermi’s order. And you could see the pointer move right back to zero. The rattle of the counters fell to a slow series of clicks. For the first time, atomic power had been released. It had been controlled and stopped. Compton: One of the things that I shall not forget is the expressions on the faces of some of the men. There was Fermi’s face—one saw in him no sign of elation. The experiment had worked just as he had expected, and that was that. Cool and collected—Fermi’s face was that of a competent man of action busily engaged on the one important job. Narrator: Forty-eight people had challenged nature in a primitive graphite pile, had coaxed matter into yielding its inner energy. It was a triumph of theory, of dedication, a triumph of experiment. It was not a scene of celebration, but a moment of calmness. Leona Woods Libby and Crawford Greenewalt cogently remember. Leona Woods Libby: Then somewhat later, after the control rods were all put to bed and the charts were pulled out and clipped up and so on, Eugene Wigner showed up with a famous little flask of Chianti. He poured it into a paper cup. He went and drank it very quietly. There was no toast, nothing, no remarks. Nothing very dramatic, really: The most effective kind of drama probably at that point. Narrator: The CP-1 experiment was history—the release of fission energy demonstrated and controlled. 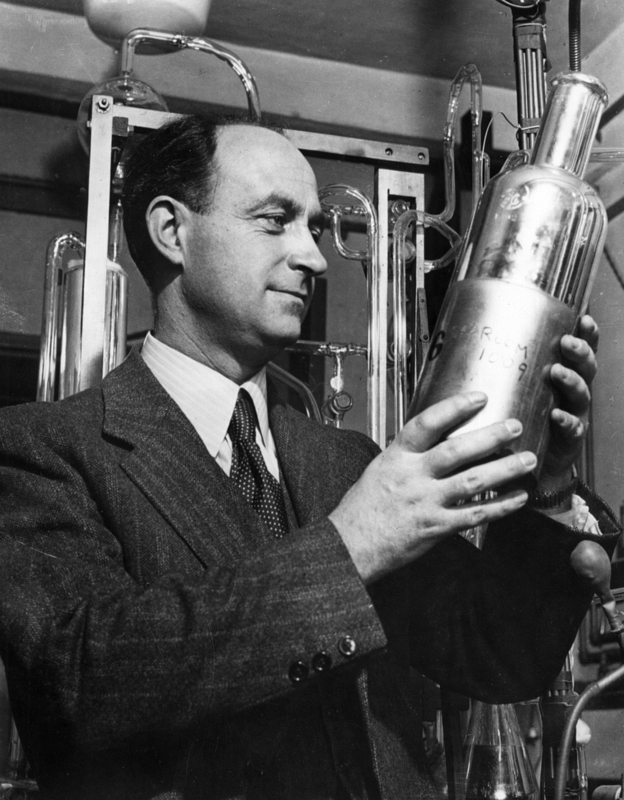 Whatever the future, Enrico Fermi had at that moment guided his colleagues to a milestone in scientific history. Herb Anderson rightfully places the honors. Anderson: Everyone really considers that the chain reaction was really the Fermi experiment. This was the Fermi experiment, as much as any experiment ever is an experiment of a single man. This was his by conception and execution, and by the detail with which he had his finger in every aspect of it—that was one of the great talents of the man. Narrator: While Fermi’s group had demonstrated and controlled fission, chemists at the Metallurgical Lab had successfully purified the first weighable amounts of plutonium: 2.77 micrograms. Each success only christened more effort. To scale up these laboratory experiments to industrial proportions might prove insurmountable. It seemed almost beyond human capability. Crawford Greenewalt poses the question. Greenewalt: It’s all very well to say, “Yes, you can have a self-sustaining chain reaction,” but to actually carry it on until one got an appreciable concentration of plutonium, and then to do a separation job on that dog’s breakfast under conditions of enormous radiation. And to separate out plutonium in sufficient purity and of sufficiently high yield to be of some use was a problem, which loomed, in my view, quite as large as the problem of building a reactor that would work. Narrator: By January 1943, the Manhattan Project had grown in all directions. Project Y had been selected on an isolated mesa thirty-five miles northwest of Santa Fe, New Mexico. By February, engineers were building the Clinton Engineer Works between the Great Smoky and Cumberland Mountains in Tennessee. In March, 45,000 construction workers began building the largest site of all, the Hanford Engineer Works along the Columbia River in the state of Washington. General [Leslie] Groves, who selected the sites, recalls his reasons for picking Hanford. General Leslie Groves: There were several reasons. One was power, one was the Columbia River, and the other thing, which was all-important, was an ability to construct year-round. Narrator: What started out as a small intimate group of physicists designing a laboratory experiment had now grown into a large, diverse military and industrial project. Until the summer of 1944, Fermi kept his residence in Chicago. He made many long trips to Hanford, Los Alamos, and Oak Ridge advising and assisting in all phases of research. General Groves had restricted top scientists from airplane travel. Fermi had to make these trips by train. On each visit, the scientists had to travel under assumed names. This led to a humorous incident that occurred to Fermi in Hanford. Colonel Frank Matthias remembers. Fermi stepped up and he says, “His name is Dr. Wagner just as sure as my name is Dr. Farmer,” and the problem was solved. Narrator: The Hanford project was a $350 million crash program to build the world’s first plutonium production facility. DuPont [Company] was undertaking an engineering feat that would strain every fiber of their industrial resources. Fermi had some simple advice for accomplishing this miracle in the desert. Narrator: There in the Washington desert, isolated from the everyday demands of life, Fermi engaged his fellow scientists in mind games. It was a carryover trait from his days in Rome, when he played the game of “Two Lire.” John Wheeler recalls the sport. John Wheeler: Of course I remember, especially the penny that he would give out—a penny any time that anybody could find an error in his English. He was resolved to make himself good in English, and not to leave any errors in what he said. Another feature of Fermi was the lunchtime. Lunch was not an occasion merely to relax and eat food. Lunch was an occasion to shoot puzzles at each other. It could be anything. You look out at the sky and you see the ripples in the sky. “Why are these ripples there?” That is the question. Any one of us might have stated it, and if somebody else could answer it, he got a penny for his answer. But if nobody could answer it, then it fell to the person who had originally asked the question to provide the answer. If he could not provide the answer, he had to pay the penny. Narrator: Although the magnitude and character of the Manhattan Project had changed abruptly since those early days in Chicago and Columbia, Fermi never lost his sense of humor. Dale Babcock of DuPont remembers. Dale Babcock: My last item will deal with Dr. Fermi. We all had a great amount of admiration for him. [He was] a tremendous figure in the physics world, but he also had a humorous side. One day, he got the people that were driving back and forth between Richland and this area where we are right now. He asked us to note, when we were crossing a certain five-mile area out here, the number of coyotes that we saw crossing the road. Well, each morning we would come in and we would say we saw two coyotes between the time of 10:00 at night and 11:00 at night or whatever this time period was. Someone else would say he saw none, and someone else would see as many as three or four. After Fermi had enough data on this, he then decided that he would make some use of it. He said he was determining the flux of coyotes, just exactly as we had been determining the flux of neutrons in a reactor. The motion of the coyotes back and forth gives a mechanism whereby you can calculate the number of coyotes that are in existence here. The arithmetic that he went through to get that—I will not go through with it, but he told us that there was about one coyote to the square mile on the project out here. Narrator: In the summer of 1944, the Fermis were to move to Los Alamos. There, in the isolation of the New Mexico desert, the war project would come to fruition. Shortly before leaving for Los Alamos, the Fermis swore allegiance to the United States. On July 11, 1944 they became naturalized citizens. In Los Alamos, Fermi served as General Consultant to the project, directing the Advanced Development Division. Here he would remain for seventeen months, a period of hard work and great happiness. He spent many leisure hours on frequent hiking trips into the nearby mountains around Los Alamos. During the working hours, he was engaged in brainstorming discussions with Robert Oppenheimer, Hans Bethe, John von Neumann, Victor Weisskopf, Bruno Rossi, his old friend Emilio Segrè, and many others. Slowly but surely, small amounts of purified plutonium began to arrive from the Hanford production reactors. The project, started in the summer of 1941, was now three and one-half years along. Early one morning on July 16, 1945 at 5:30 a.m., Fermi found himself ten miles from Ground Zero. He was gazing intently at the horizon while busily dropping small pieces of paper to the ground from a height of six feet. Suddenly, the predawn sky was ablaze with light. Only seconds later, the front of the shockwave reached Fermi and his colleagues. By measuring the displacement of the confetti produced by the shockwave, Fermi was able to determine the energy release of the explosion, the same force as that produced by 10,000 tons of TNT. Project Trinity vividly demonstrated the long suspected secret of the immense energy slumbering in the heart of the atom. Fermi again was displaying his uncanny clairvoyance. Herb Anderson, who knew him best, remembers. Anderson: I think his great strength in the war was his clear thinking and instantaneous—I used to say that he had no inertia. He would start to work out a problem just as soon as he heard it. If you could pose a problem, he immediately tries to solve it. He doesn’t wait for the evening, or when it is quiet, or when there is not any noise around. There could be any amount of din, and you would pose a problem to him and he immediately wants to solve it.